Quilters Etc. members enjoy a variety of activities including workshops, classes, sew-ins, retreats and our monthly meetings. We also make quilts for charity, get together for friendship groups, and inspire each other with a block-of-the-month program and our annual challenge project. And, there's our quilt show where we all work together to share our passion with the community. We hold meetings on the 4th Thursday of each month from January through October (we take a break in November and December and the June meeting is the 3rd Thursday due to the Lompoc Flower Festival). The regular meetings generally include a guest speaker or special event, show and tell, door prize and fabric bonanza drawings, and other fun. We have a great time at our meetings. Guests are always welcome. First-time visitors are free, admission for non-members that come back is $3.00. Meetings take place in Lompoc at the DeWees Community Center at 1120 W Ocean Avenue in Lompoc, CA . Social time and snacks begin at 6:30. Programs and Guild business begin at 7:00 p.m. Bring a snack to share! The Fabric Bonanza drawing is one of the regular features of our meetings. Members who wish to participate should bring a 100% cotton, fat quarter (18"x22") of good quality quilting fabric in the month's theme. Lucky winners get a stack of fabric to take home. Workshops and classes for Guild members also occur throughout the year. Attendees have a chance to learn a new technique, build their skills, or take on a new project while enjoying the company of fellow Guild members. Workshops often feature guest speakers from our monthly meetings or Guild members sharing a special talent. Over the course of the year we also get together for sew-ins and retreats. These are a fun way for members to get to know each other better while getting a lot of work done away from everyday distractions. Every year members are presented with a challenge, usually in the form of a piece of fabric and a few instructions or guidelines. Past challenges have included completing an unfinished project, creating a bag using recycled materials, and an ice cream challenge. It's always exciting to see the creativity of the members on display and picking out a favorite often proves to be the real challenge. All of the members are also challenged each year to complete a cuddle quilt (or a hematology quilt) to be donated to a local organization. This is one way we can turn our talents toward helping those in need and giving back to our community. A few of our most generous members complete one or two every month! 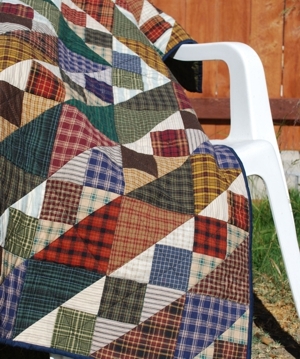 Making these quilts provides a great way to try a new technique or use up scraps while helping someone in need. The Guild provides batting - pick it up at the monthly meeting - and distributes the finished quilts. Cuddle quilts are given to various local agencies to be distributed to needy children. Hematology quilts are donated to the Hematology Clinic for adults undergoing chemotherapy and/or radiation treatment. Cuddle quilts should be lap size (45" x 60"). Hematology quilts, though also roughly lap size, should be large enough to cover an adult. We're already working on the quilts to display at our next quilt show. Every other year the Guild hosts a quilt show featuring members' quilts. Highlights of the show include the opportunity quilt and mini quilt drawings, which serve as important fundraisers for the Guild and offer the chance to win a beautiful bed-size or miniature quilt made by Guild members. Our next show is planned for 2019.